Jump is Native Union's one-of-a-kind, all-in-one Lightning connector cable and backup battery pack charger designed for the iPhone 5s, 5c and iPhone 5. Android, Windows Phone and any remaining BlackBerry users will be glad to know that the Jump is also being offered in a micro-USB version alongside the Lightning connector variant. Native Union's Jump combines a lengthy yet neatly organized Lightning connector to USB cable made out of a durable nylon material that works just like the one Apple provides with iPhones, but in the center it features a highly-portable battery pack with just enough juice to charge your iPhone back to 30% in case of an emergency battery drainage. You can technically use the Jump as a Lightning connector charge and sync cable with an iPad Air or iPad mini, but you definitely wouldn't want to use it as a backup battery charger for tablet use considering its ill-equipped battery capacity. 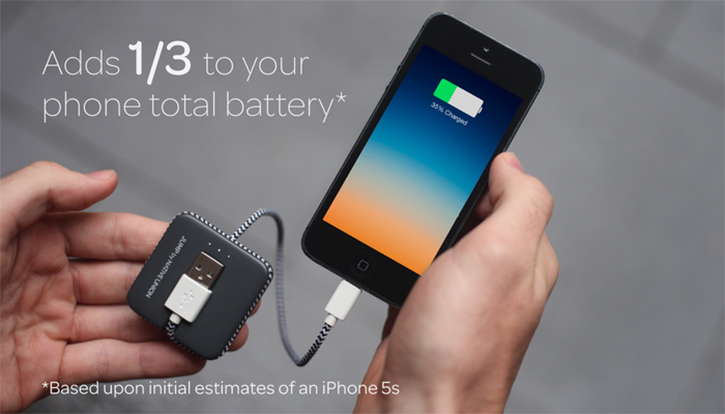 The all-in-one unit charges its built-in 800mAh rechargeable battery once it senses that your iPhone completed its charging, and intelligently switches the power from your computer's USB port or any other USB power adapter in order to charge itself without requiring additional charging cables like traditional backup battery packs. Though this may be an early flaw for the Jump if users won't be able to charge it by itself without having to connect its Lightning connector cable to an iPhone. Although we think Native Union may have simply left that small detail out with regards to charging the Jump on its own. Update: and indeed Native Union has reached out to us to clarify that the Jump will in fact recharge itself even when it isn't connected to a smartphone device. The Jump features a cable organizer that let's you wrap excess cable when you're either charging your smartphone or fully wrap the 19" long cable around it when it's time to slip it into your pocket. And because the Jump is as light as two AA batteries and small enough to fit into your tiny coin pocket on your favorite pair of jeans, you won't have an excuse not to take it with you at all times. There are three battery status LED indicators to let you know the battery status of the Jump with a push of a button. Native Union's Jump is currently available as an early pre-order gizmo over a Kickstarter for $35 - $40. Native Union is targeting the month of May as a final shipping date for pre-orders. eleMount is one of the latest Kickstarter accessories to offer a simple and versatile mounting solution for smartphones and small tablets alike. The eleMount sells itself as a premium, universal aluminum mount that uses special, reusable adhesive sticky pads called elePads which form a strong bond on any flat surface without leaving behind any residue. The eleMount uses two of these elePads to secure itself onto car windshields, desks while the other lets you securely mount any smartphone or tablet like the iPad that has a flat smooth back, in either vertical or horizontal orientation. For movement, the eleMount's metal ball joint offers a firm 360-degree viewing angle adjustment without clamping down any locking mechanism. Unscrewing its bottom elePad reveals a threaded 1/4" 20 tripod adapter. eleMount’s simple and sleek design is due in part to its proprietary elePads, which eliminate the need for unsightly plastic locks and clamps. These polyurethane pads stick to almost any flat surface for incredible versatility, while their edgeless design supports a wide range of devices including iPhone 4/4s, iPhone 5, iPad, Samsung Galaxy S4, Samsung Galaxy Tab, HTC One and many more. The elePad’s easy-to-use design works just as you’d expect. Simply mount the elePad to any clean, dry surface, apply pressure and you're done. Although eleMount specifically claims to work on smooth flat surfaces, devices like the HTC One and Moto X which have a tapered back design to them will also work with the eleMount due to the large elePads and their great sticky compound. 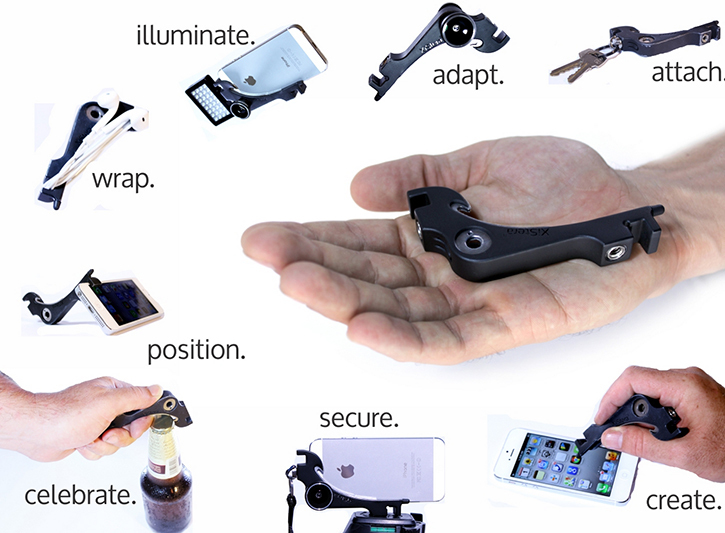 Early backers can secure an eleMount in either black or silver anodized and sandblasted matte finish for $59. For people who are more interested in the universal tripod mount side, there's the eleMount mini which is the same as the original model but without the elePad bottom portion that screws on and off. 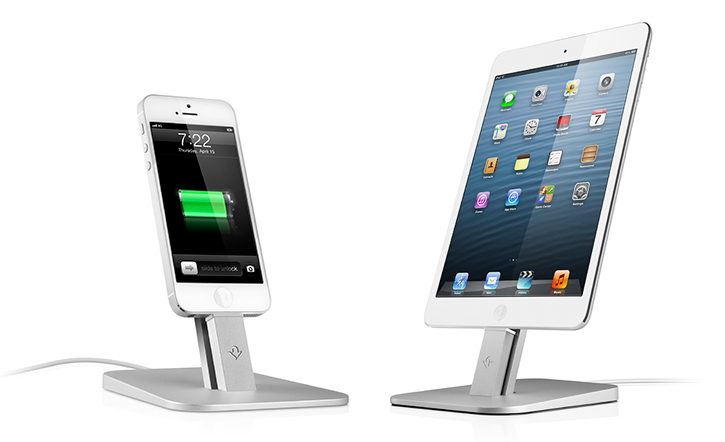 Twelve South has introduced the HiRise for both the iPhone 5 and iPad mini, a $35 uniquely designed brushed metal desktop stand dock that utilizes your Lightning cable to form a charging plinth which also puts your iPhone or iPad mini as a much closer viewing level as does Twelve South's HiRise for the iMac. Aside from its wide sturdy base and narrow Lightning connector stem that doesn't block the headphone port, mic and speaker of your iPhone 5, the HiRise stand features a height-adjustable Lightning connector along with an adjustable back support that allows it to fit virtually any slim and bulky iPhone 5 and iPad mini case with a recessed connection port opening including but of course Twelve South's BookBook vinage leather wallet case. If you're looking for a hands-free stand with built-in charging functionality that you could actually use with your iPhone or iPad still attached, the HiRise seems to fit the bill without costing more than a regular protective case. We can only assume that Apple's next generation iPhone 5S will work with the HiRise thanks to its adjustable features so you could say it's a future-proof stand dock. It's worth noting that the HiRise also works with other Lightning connector Apple devices like the iPod touch 5 and 7th generation iPod nano. 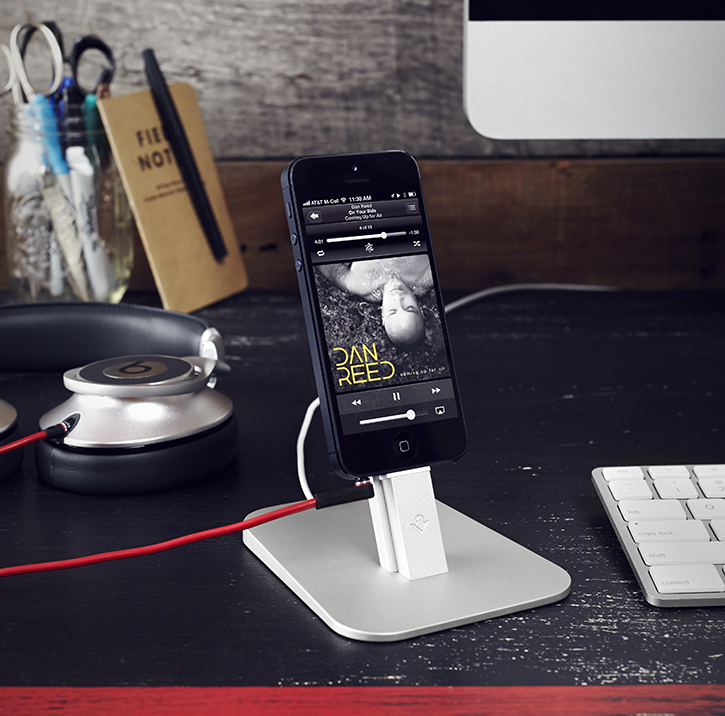 Twelve South's HiRise for the iPhone and iPad mini is now available. Check out the video of how it all comes together after the break. Meet the Saidoka, Blouelounge's latest and unique Lightning docking accessory for the iPhone 5 that combines a subtle resting spot where you can charge, sync and view things on your iPhone at a convenient birds eye view. Slightly tilted up and set at the optional viewing angle for when you're sitting at your desk, your iPhone 5 is cradled inside the Saidoka atop a soft rubbery surface which can be removed to accommodate a protective case. The Saidoka was made to have a fairly large base which features micro-suction feet that grab a strong and firm hold of a desk's surface providing you with a sturdy platform to dock and undock your iPhone using only one hand. 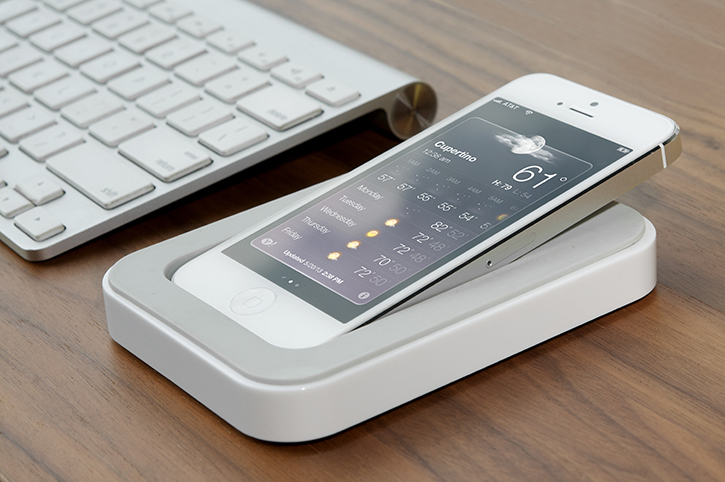 Now that's an intuitive docking solution, albeit not as intuitive as wireless charging. Are you someone who uses their iPhone's mute switch on a daily basis only to be reminded that, well, it really silence your iPhone completely. The mute switch is actually only designed to mute your ringtone and not Siri, music, video, mail alerts, camera shutter and other apps that can disturb your one simple request for silence. Mutator is one clever little low-profiled dongle shaped like a pyramid that plugs directly into your headphone port, and with a twist, Mutator will instantly and completely silence your iPhone from any and all unwanted sounds except for any alarms you've set of course. It also won't interfere with the actual mute switch, meaning it won't silence your ringtone/text audio notification instead. Twisting it back disengages its silencing effect. That quick and brilliantly easy. A white indicator is notched into one side of the Mutator to serve as a visual on/off indicator. The one negative concerning such types of add-on accessories like the MyLED and many before it, is having to sacarfice your one and only headphone port. You can pre-order it via Kickstarter right now for $16, in either black or white. Among the plethora of short Lightning connector cables that have recently hit the market comes a more versatile accessory called the Trunk. 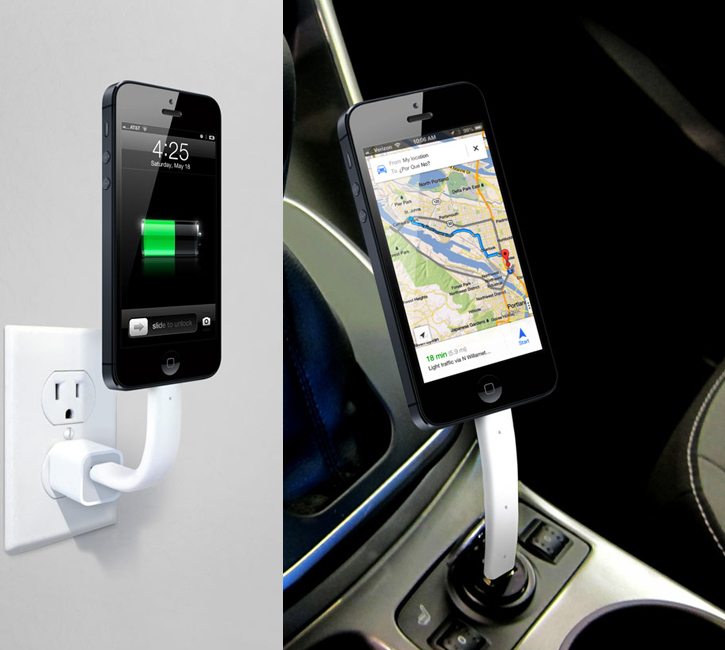 Not only is it a shortened USB to Lightning connector charge & sync cable, but a cable that can be bent like a gooseneck into a vertical in-car GPS stand among other uses when plugged into a USB outlet. It's solid, yet it's also flexible just like Laffy Taffy. Now let's see your limp Lightning cable do this. The Trunk is made by iLoveHandles, the same folks that have come up with other ingenious accessories for Apple products like the Facet magnetic pyramid stand for iPads. By the look of it, the Trunk doesn't seem like it would fit many protective iPhone 5 cases so keep that in mind. A micro-USB variant is also available in black for all you Android users. Both can be pre-ordered now for $20, and are expected to ship on June 15. Needless to say, the iPhone is a fantastic little device we take everywhere with us. It lacks a huge screen yes, but you can make up for that little nuisance in a big way thanks to a magnitude of useful accessories made exclusively for the iPhone, leaving the well endowed with their removable batteries and widgets. What if someone took some of Kickstarter's big iPhone accessory hits such as the Glif tripod mount, the Opena bottle opener case and the olloclip lens attachment to conceive one accessory that does it all? 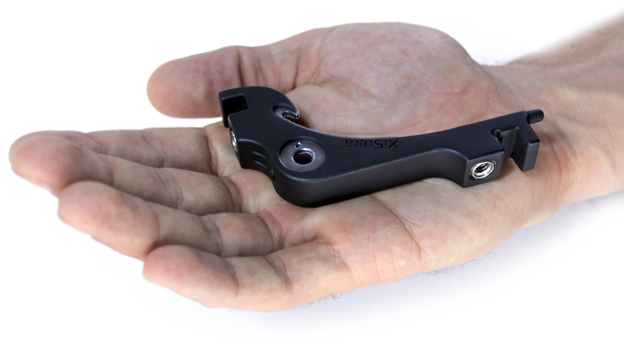 XiStera is an all-in-one accessory adapter for the iPhone 5 which combines some of the best Kickstarter accessories into one affordable gizmo. Shamelessly designed after the Glif tripod mount, the XiStera is rigid one-piece rubber adapter with metal interior hardware that attaches to the side corner of the iPhone 5. It features 8 functions including a bottle opener, a stylus tip, a tripod mount with portrait and landscape threading points, an angled landscape and portrait stand, keychain attachment, EarPods/earphone organizer, and best of all an interchangeable magnetic 3-lens adapter (macro, fisheye, wide angle) you can fit into your pocket. You can pre-order the XiStera starting at $30 for a limited time ($35 soon after), or if you're really into using your iPhone 5 as your dedicated camera - you can opt for the $50 pro package which includes two extra telephoto lenses and a rechargeable 32 LED video light that you can attach to one of XiStera's two tripod threads. By the look of it, these guys thought about everything, took some great Kickstarter ideas and improved upon them with the XiStera iPhone 5 adapter.